Why am I reading stuff in English but also in Portuguese!? Because I’m a ESL kiddo that writes stuff for both English and Portuguese speaking sites and blogs. It’s a place to store my grumbling writing and occasional anime reviews. I used to write and post everything at MAL, but the disgusting “community” and lack of editing options just ruins the experience. Why is the domain address FakeMoriSummer and the blog title BasedShinjiSays? Because I thought both would be comical names from this, and in the end I couldn’t choose between them. 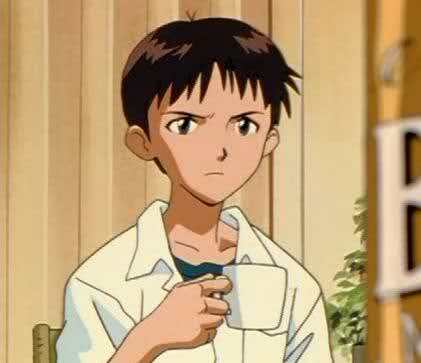 I also considered “Shinji and his mug” but gave up on that. Are you a fan of Shinji or Nibutani? Nibutani was awesome during the 1st season of Chuu, but then they fucked up her character at the 2nd season, turning her in some cardboard sidekick supportive character with nothing to add except the romcom’s mandatory “I’ll be your cupid”. She’s still by far the best girl, though. I have “anime-related” accounts on MyAnimeList.net and DeviantArt. Don’t expect fast replies to messages sent there, though. I only used those as storage/backlog. Also as any self-righteous mildly intelligent anime watcher with questionable self-respect, I lurk a certain clone of a Mongolian picture board about Chinese cartoons whose cuck creator recently sold out to Hiroshima Nagasaki. However as any self-conscious anonymous member of said community, if questioned, I’ll endlessly complain about its declining quality and promptly ridicule anyone who claims to be new or don’t know about it.